The earliest evidence of tattooing includes tattooing tools and tattooed mummies. At 10,000-year-old sites in Tan-zoumaitak, Algeria, tattooing instruments used for puncturing the skin were found with the female tattooed mummy of Tassili N'Ajje. In 1991, Otzi, a Stone Age male mummy, was found in the Otztal Alps, bordering Austria and Italy. This mummy had numerous tattoos, which were hypothesized as being used for medicinal cures, spiritual ceremonies, or indicating social status. Two well-preserved Egyptian mummies from 4160 b.c.e., a priestess and a temple dancer for the fertility goddess Hathor, bear random dot and dash tattoo patterns on the lower abdomen, thighs, arms, and chest. In 1993, a fifth-century b.c.e. Ukok priestess mummy, nicknamed the Siberian Ice Maiden, was found on the steppes of eastern Russia. She had several tattoos believed to have had medicinal, spiritual, and social significance. Most of the 4,000-year-old adult mummies from Xinjiang, China, had tattoos that related to their gender or social position. Classical authors have written about tattoos used by the Thracians, Greeks, Romans, ancient Germans, ancient Celts, and ancient Britons. Tattooing has been practiced in most parts of the world, although it is rare among people with darker skins, such as those of Africa, who more often practice scarification and cicatrisation. 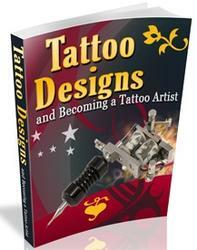 Scholars hypothesize that tattooing was a permanent version of the desired aesthetic of body painting. Motivations, meanings, and exact techniques relating to tattoos vary from culture to culture. Tattoos have emphasized social and political roles; indicated cultural values and created an identity for the individual; reinforced aesthetic ideals; encouraged sexual attraction; eroticized the body; served medicinal and healing roles; communicated group affiliation or membership, and emphasized ritual and spiritual roles and customs of a culture. Polynesia. In 1787, a French expedition led by Jan Fran-coise de la Perouse landed on Samoa and reported the men's thighs were heavily painted or tattooed, which gave the appearance of wearing pants. Samoan tattoos were applied with ink, tattoo combs, and hammer. Male tattoos had larger black areas than females, who had lighter, more filigreed lines. Borneo. In the nineteenth century, Americans with tattoos were sailors and naval personnel, who wrote about their tattoo experiences in ships' logs, letters, and journals. During World Wars I and II, some U.S. soldiers and sailors decorated their bodies with tattoos. Usually these tattoos were from a set of stereotypical symbols— courage, patriotism, and defiance of death—later referred to as "flash." In the early 2000s, flash includes a wide variety of stock art used for tattoos. Central America. In the nineteenth century most of Europe did not allow tattooing because the Catholic Church admonished it. However, tattooing flourished in Eng land, due primarily to the tradition of tattooing in the British Navy. Many British sailors returned home with tattoos that commemorated their travels, and by the eighteenth century most British ports had at least one tattoo practitioner in residence. In 1862, Prince Edward of Wales had a Jerusalem cross tattooed on his arm to commemorate his visit to the Holy Land. 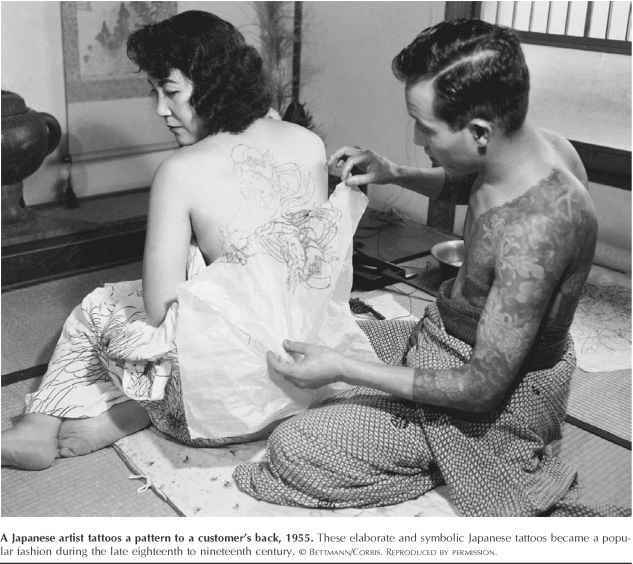 Later, as King Edward VII, he acquired additional tattoos, and even instructed his sons, the Duke of Clarence and the Duke of York (King George V), to obtain tattoos to commemorate their visit to Japan. In 1941, the Nazis registered all prisoners entering the Auschwitz concentration camp who were not ethnic Germans with a tattooed serial number. This tattoo was first placed on the left side of the chest; later, the location was moved to the inner forearm.